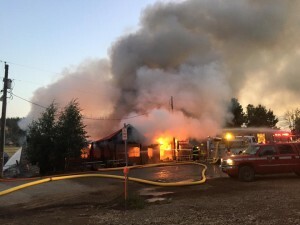 DUCK CREEK VILLAGE – A devastating structure fire in the Kane County community of Duck Creek Village claimed three buildings early Wednesday morning, including Hot Mama’s Pizza & Brew, the storage cabin behind the Hot Mama’s property and a cabin owned by Falcon’s Nest Cabin Rentals. 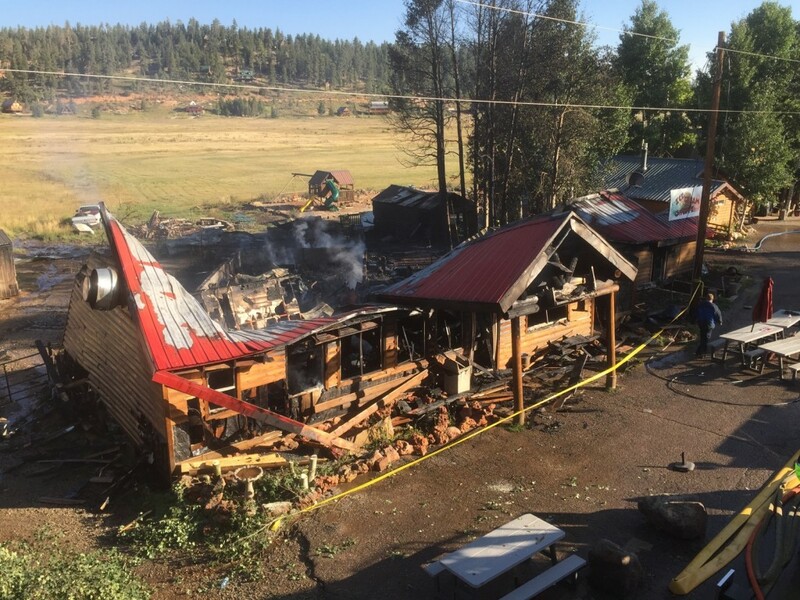 Reports of the fire came in just before 6 a.m. Cedar Mountain Fire Protection District Fire Chief Casey Tuttle was the first responder on the scene, but by the time he got there, he said, the family pizzeria was already fully engulfed. Finding a structure fully engulfed is typical in the case of an early morning fire, he said, because most people are asleep and the fires often go unnoticed. A neighbor in the area who saw the fire was the first to report it, Tuttle said, and that same neighbor called the owners of Hot Mama’s to let them know. Hot Mama’s Pizza & Brew owner Sam Atkinson said he awoke at about 5 a.m. Wednesday, and he was just settling back into a deep sleep when his phone rang at 6:30 a.m. with news of the fire. Just hearing the word “fire” through the phone quickly sent his half-asleep fiancé, Ashley Romero, jumping from their bed, Atkinson said. As they drove into the village from their home across the meadow, he said, they could see the flames, but they were not convinced until they drew closer that the fire was contained to the Falcon’s Nest next door. Firemen were already on-site when they arrived, Romero said. Responders came from so many departments throughout the day, she said, and she could not believe the support and heartfelt condolences shown by first responders who spent the day with them. 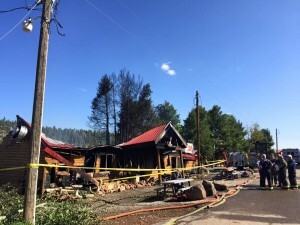 Ten volunteers with the Cedar Mountain Fire Department made their way to assist in the early daylight hours, Tuttle said, along with countless others who came from different departments around Duck Creek Village and beyond. 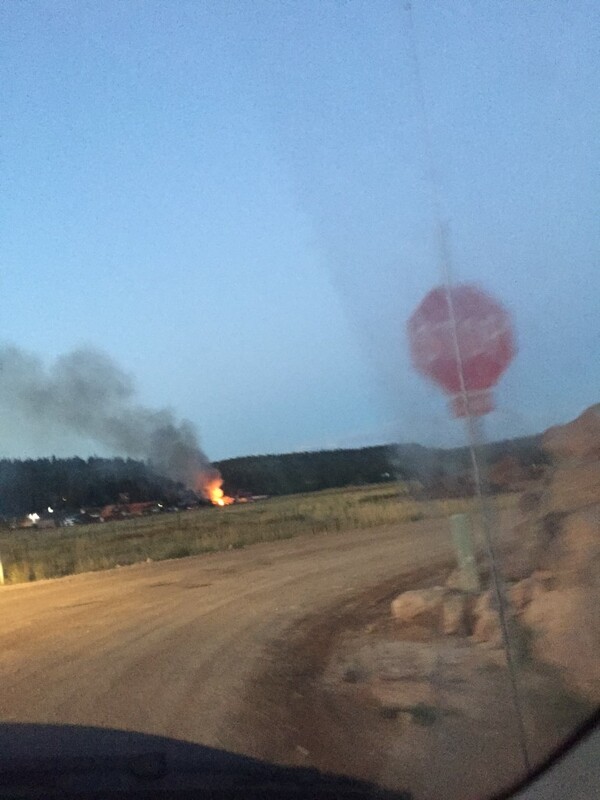 Alton, Orderville, Kanab and Cedar City fire departments responded to assist with the fire in case it took off through the meadow, Tuttle said. The Kane County Sheriff’s Office, Alton Ambulance, the Department of Natural Resources State Engine 664 and the Utah Division of Forestry, Fire and State Lands also responded. (See ed. note.) Though no one was injured in the blaze, Alton Ambulance responders stayed through the duration of the aftermath and investigation just in case they were needed, he said. While responders were fighting the flames and working to contain them, a loud explosion blew all the glass out of the back of the building, Tuttle said. As far as they could gather, he said, the blast originated from the carbon dioxide containers that were used in the soda fountains. It was very fortunate the meadows didn’t catch fire considering the ferocity of the burning structures, Tuttle said. 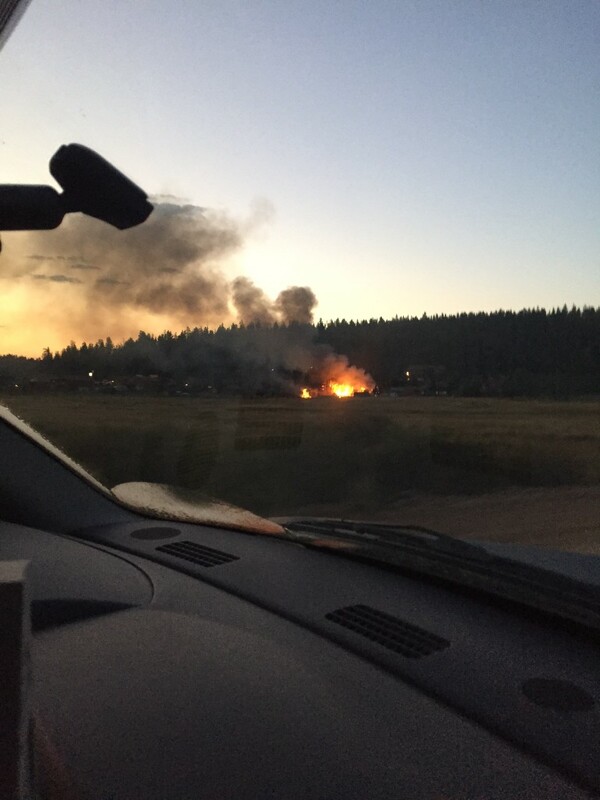 Though they didn’t get the fire under control quickly, he said, they did get it contained by the time backup began to arrive so it wouldn’t spread to the meadow or any other buildings. “We were pretty much whipped at that point when the outside agencies started rolling in with our mutual aid contract agreements,” Tuttle said. The cause of the fire is undetermined, he said, but investigators believe it may have started with a faulty electrical source. Insurance investigators will weigh in on Thursday. Hot Mama’s neighbor Falcon’s Nest lost a cabin in the blaze, Tuttle said. The owners had been in the process of converting the cabin into a laundromat. The Falcon’s Nest used to belong to his uncle, Atkinson said, but his uncle passed away a few months ago and the family sold the business to new owners. 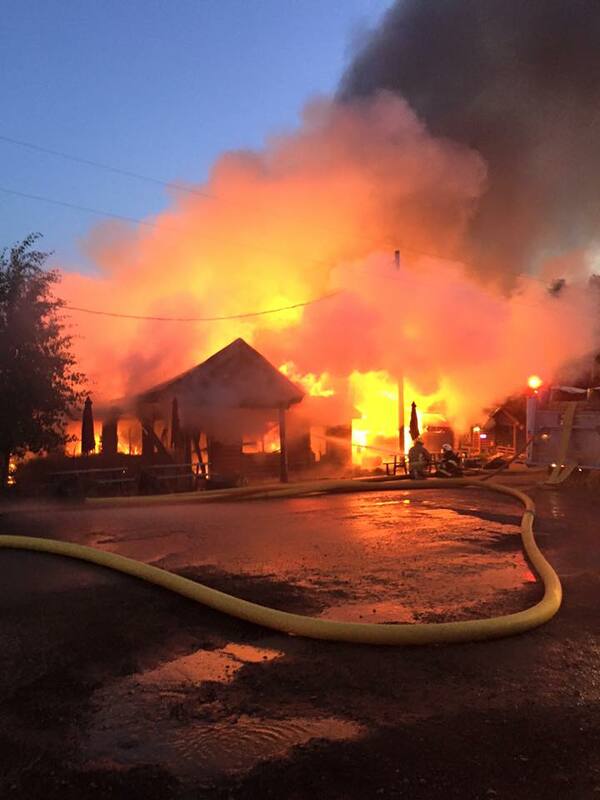 Everything that burned in Hot Mama’s had sentimental value, Atkinson said. The building that Hot Mama’s Pizza & Brew was housed in belonged to Atkinson and his parents for years before it became a pizzeria, he said; when they leased it to other business owners, Atkinson handled all of the maintenance. This is the eighth year the busy establishment has been in operation, Atkinson said, and they started the whole thing with only 82 cents in their pockets. The family plans to rebuild the well-loved pizza establishment, Atkinson said, adding that no matter what comes next, there will still be a vacant space in his heart for the building that burned to the ground Wednesday morning – a building he personally performed repairs and renovations on. The business had insurance, Atkinson said, but it will hardly be enough to cover the damages because there were a lot of items that were uninsured in order to cut some outgoing finances and keep up with the cost of living. Romero’s aunt created a GoFundMe account for the family to help in the aftermath of the fire, Romero said, and within the first hour they had over a hundred shares. As of 10 p.m. Wednesday, the fundraiser had reached $1,220 of the stated $5,000 goal; the money was raised by 14 people within eight hours of the page’s launch. This report is based on preliminary information provided by emergency responders and may not contain the full scope of findings. Ed. note: Omitted agency added. I know this is devastating but no one was hurt and no lives lost. and you can always replace a building or a cabin. I know. It’s easier said than done. but the most important thing is. No lives were lost. I hope the best for all those concerned. 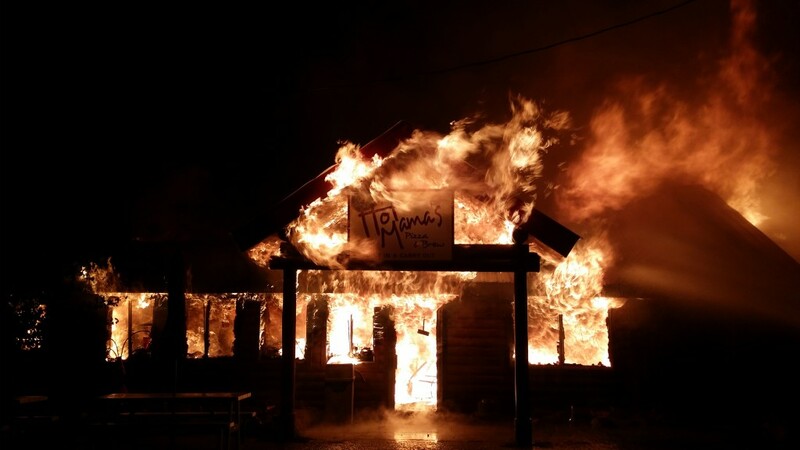 Glad no one got hurt… they may want to rethink the name “Hot Mama’s”.